A major novel about a Gypsy woman exiled for betraying her people: the novel begins in Czechoslovakia in the early 1930s when Zoli, a young Roma girl, is six years old. The fascist Hlinka guards had driven most of her people out onto the frozen lake and forced them to stay there until the spring, when the ice cracked and everyone drowned – Zoli’s parents, brothers and sisters. Now she and her grandfather head off in search of a ‘company’. Zoli teaches herself to read and write and becomes a singer, a privileged position in a Gypsy company as they are viewed as the guardians of Gypsy tradition. But Zoli is different because she secretly writes down some of her songs. With the rise of the Nazis, the suppression of the Gypsies intensifies. The war ends when Zoli is 16 and with the spread of socialism, the Roma are suddenly regarded as ‘comrades’ again. Zoli meets Stephen Swann, a man she will have a passionate affair with, but who will also betray her. He persuades Zoli to publish some of her work. But when the government try to use Zoli to help them in their plan to ‘settle’ Gypsies, her community turns against her. They condemn her to ‘Pollution for Life’, which means she is exiled forever. She begins a journey that will eventually lead her to Italy and a new life. 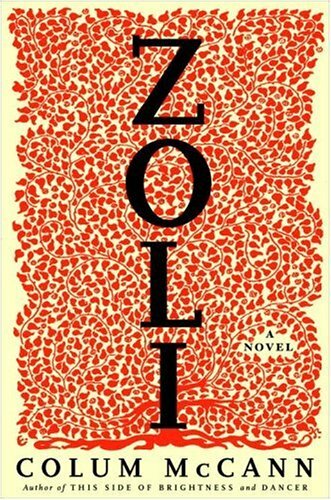 Zoli is based very loosely on the true story of the Gypsy poet, Papusza, who was sentenced to a Life of Pollution by her fellow Roma when a Polish intellectual published her poems. But McCann has turned this into so much more – it’s a brilliantly written work that brings the culture and the time to life, an incredibly rich story about betrayal and redemption, and storytelling in all its guises.